Today, Dad, Mongo, and SPORK all headed up to the mountains for a hike. The days were getting longer and the crew had a morning start at driving to the trailhead. 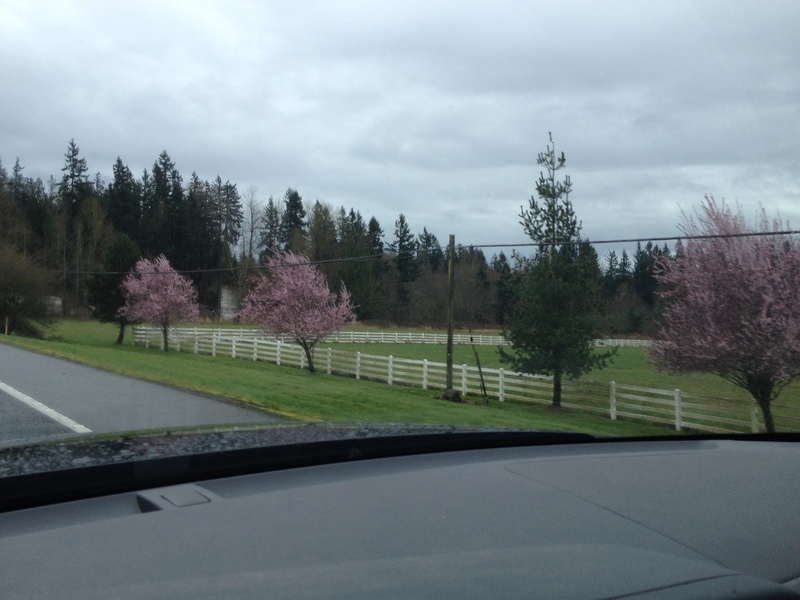 The cherry trees were blossoming as Dad drove through Enumclaw. He passed the Pie Goddess shop on the way through, but made a note to stop in later. The sky was showing some blue hidden in between the big white puffy clouds. It was a little cool out, but just right for a stirring uphill hike. The last time the team had visited the Wenatchee National Forest, it had been snowing in the mountains, and all of the mountains had a frosting of snow on their tops. This time the cherry trees were blooming in Enumclaw. Dad parked in the National Forest Parking lot this time instead of along the highway. The last time up they had parked at the trailhead along HWY 410, but on the way out, Dad had noticed a pile of broken auto glass on the ground. It could have been the evidence of an old “smash & grab”. Dad could not convince himself that people would drive all the way up the mountian to break into cars, but he couldn’t quite convince himself that they wouldn’t either. So he parked in the regular parking lot. Dad left Mongo and rainy Seattle behind to go address a conference in Phoenix. Not that Dad liked leaving his buddy behind, but as they say, “Business is business”. As Dad arrived at the hotel, he drove past a big canal filled with slow moving green water. The canal had a jogging path along side of it. He had brought his running shoes and shorts for just such an opportunity. Mongo wishes everyone a happy St. Patrick’s Day. Dad and Mongo grabbed some food to go, and then headed towards the West Seattle Ferry Docks. It was time to pay a visit to George and Linda at the Palouse Winery, and explore a little bit of Vashon Island in the process. 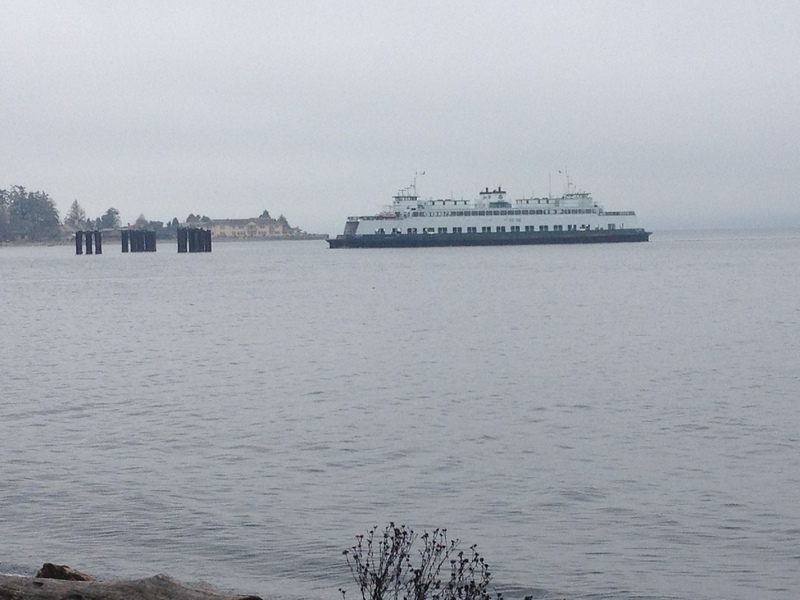 They were lucky on the way to Vashon, the ferry was loading just as Dad pulled into the line. It was another cloudy and wet day, but that was not the kind of thing to dissuade Dad and Mongo from a hike. In fact, it just meant that they would most likely have the trail to themselves. And that the winery tasting room would be pretty quiet also, meaning there would be more snacks for Dad. One dock worker directed Dad onto the ferry, and then another one made sure Dad’s truck was properly parked. He made sure Dad was up close to the car in front, and then crossed his wrists to show dad to cut the motor. Dad smiled at the man’s use of the aircraft marshaling signal. It seemed appropriate since Mongo and Dad were going to stop by George’s winery and George had been Dad’s instructor when Dad got his tailwheel rating in the Cub. The signal brought back fond memories of some of Dad’s piloting adventures. Dad hopped out and opened the hatch on the truck canopy to let Mongo see out. The people behind him were quite amused as Mr. M made many different faces at them from the back of the truck. 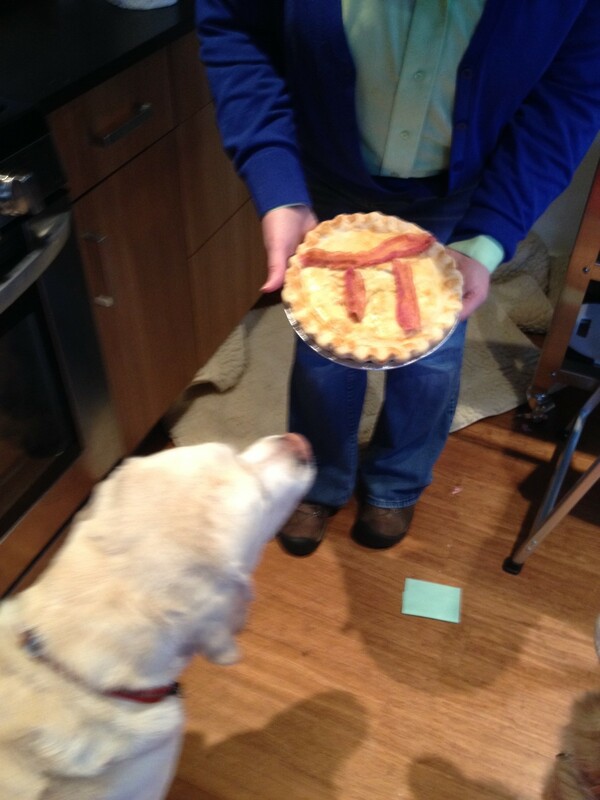 Mongo wishes everyone a happy Pi Day on 3.14.15. 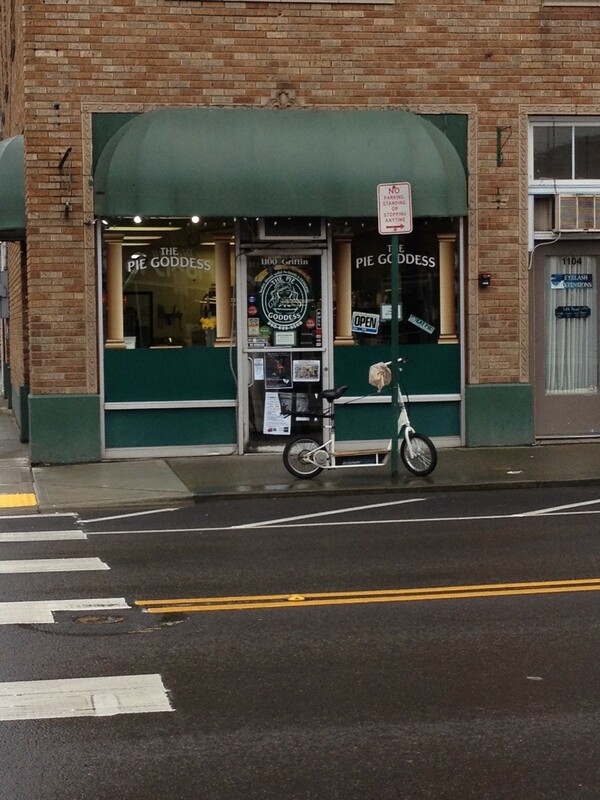 Dad drove out to the Pie Goddess Shop in Enumclaw, WA for an appropriate pie for the celebratory dinner. Trees were blooming along the side of the road. Dad picked the chicken pot pie. Mongo like PIE! Mongo was ready for some outdoor time. Dad took him to the big park by the water. They headed into the forest trails, and we meandered back and forth through the woods. It was gray and cloudy, but they were having a fun time in the wet forest. Dad was hoping to scrape some of the mud from Ellensburg off his boots, but he did not have much luck. Dad had to be careful walking with Mongo as Mongo’s “world view” was over a meter lower than Dad’s. Sometimes Mongo wanted to go under fallen trees that would taken Dad’s head clean off. They often disagreed on which was the best path to take, but since they were headed nowhere in particular, they could often choose neither, particularly if each trail in one direction was difficult, as in one had low obstacles and one had high obstacles, Dad would just head off in another direction. Finally, they popped out of the forest near the path to the beach. The path runs along the face of the bluff on its way to the water. Mongo tugged on the leash all the way down the long path. The path wasn’t very wide and people who were not dog friendly often pinned themselves up against the bluff as Mr. M went by. He is not aggressive, but at 90 lbs with a head like mastiff, he has an intimidating appearance. And that perception is amplified in close quarters. At the beach, Dad looked down and saw he still had mud on his boots. Mongo and Dad walked to the edge of the water and soaked their feet. Mongo came out nice and clean. Dad still had mud on his boots. They walked down the path at the edge of the beach. Lots of dogs were out for walks. Dad only let Mongo visit with the friendly ones. Dad still didn’t trust pointy dogs to be polite to Mongo. Then they headed on the uphill part of the loop back to the car. Dad stood in a stream to try wash some more mud off his shoes. Mongo took a drink from the stream. Dad stepped out of the stream with his boots still covered in mud. At the top of the loop, there was a group of women all waving sticks in the air. Mongo and Dad were intrigued. 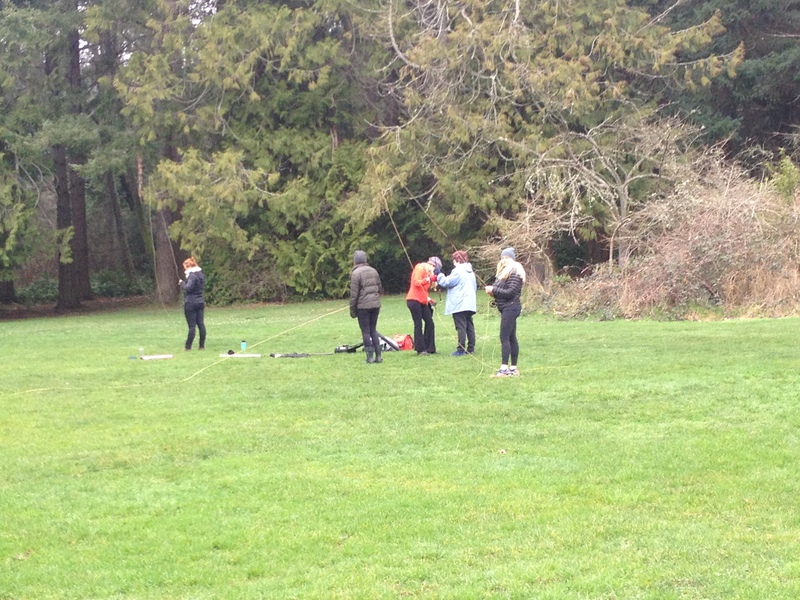 As they drew closer, they saw that this was a fly fishing class for women. They all seemed to be enjoying themselves as they flung the fly line around the field. Dad and Mongo watched for a moment. Some of the women were quite good. Then Mongo and Dad headed over to the truck. Dad looked down. His boots were still muddy. He changed into his trail shoes and put the boots in the back of the truck with Mongo again. Then they drove off to get lunch. Dad showed up at Mom-mom’s house in the morning wearing outdoor clothes. Mongo knows outdoor clothes versus go-to-work clothes. If Dad is wearing go-to-work clothes, Mongo won’t even get up from his rug to bed when Dad heads to the door. But if Dad is wearing outside clothes when he heads out, it is best not to stand between Mongo and the door. This morning Dad headed out the door and Mongo almost toppled Dad as he sprinted out the open door through Dad’s legs. They raced up the stairs and over to the truck. Dad loaded Mongo up on the ramp into the back of the truck, and together they drove out of the neighborhood. It was rainy in Seattle as they headed up to the pass. It was slushy as they cleared Snoqualmie, and the windshield was being pelted with a mixture of rain and snow. As they crested the pass, the weather improved. 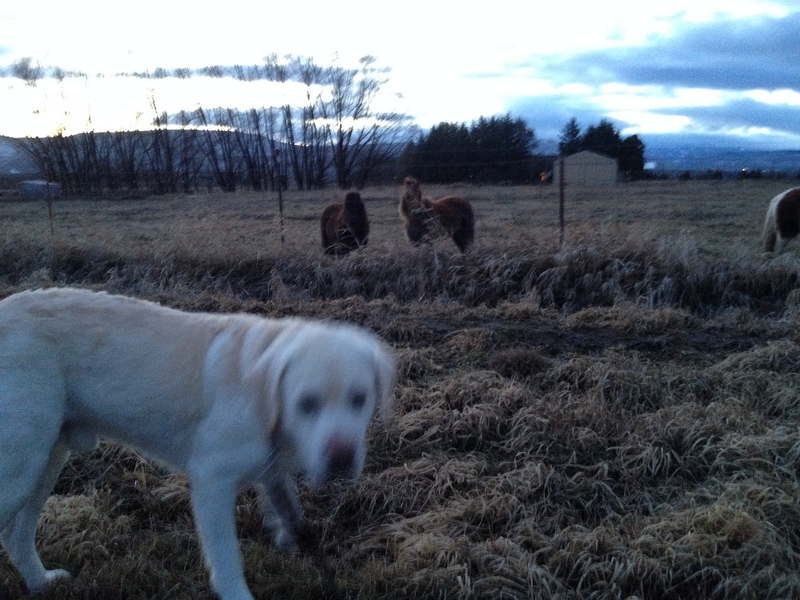 Dad drove through Ellensburg and out to the ranch. He left Mr. M in the truck and went in to talk to the owners. Alice was a sweet as ever, and showed Dad which field they would be hunting. Dad came back out and they drove down the dirt roads to the fields. Mongo had to stay low in the bed of the truck to keep from being jostled. Finally the truck stopped. Dad let Mongo out. They waited for the guide to come out on her 4-wheeler. Dad put on his boots and vest, and readied his shotgun. Mongo raced around the parking area sniffing everything. He was electrified with anticipation. Hunting birds was what he was bred to do and it came to him instinctively. The young lady showed up and gave them the “Ok” to head into the field. It was cold and the rain from the night before was frozen the ground. It made the ground a little uneven, but it was not hard to walk on. Suddenly Mongo bolted up the hill. Dad knew this was a bad thing. He started yelling and running after Mongo, but his heavy boots, vest full of shells, and the shotgun cradled in his arms all conspired to slow him down. Mongo crested the hill before Dad had even reached the mid-point. Dad know it was hopelss now. He watched as Mongo flushed a bird well over a hundred yards from where Dad stood. Dad stopped running and just yelled. Dad had learned many choice words in his many years the stream of invective rivaled that from Ralphie’s father in A Christmas Story, and might even have made Grandpa, the old Navy Masterchief, blush. But Mongo still did not return. Dad gave up on yelling and finally raised the shotgun and fired into the air. Mongo knew that sound and came running to see what Dad was shooting at. Dad grabbed his collar, and Mongo was subjected to a second stream of invective, until Dad was out of breath. Mongo looked up at Dad with sad eyes. He was no longer electric. Dad ended the scolding with. “Now HEEL!” Mongo stayed right by Dad’s side till they got to the top of the hill. Dad looked Mongo in the eye again before telling him, “Now huntemup!” Dad still did not sound pleased. This time Mongo did exactly what he was supposed to do and orbited in a circle about 20 yards away from Dad. Hey moved slowly through the field, working as a team as they looked for pheasants. Finally Mongo drew up in front of a sage brush on top of the mesa and held perfectly still. Dad maneuvered into position, taking into account the direction of the wind and of the sun. 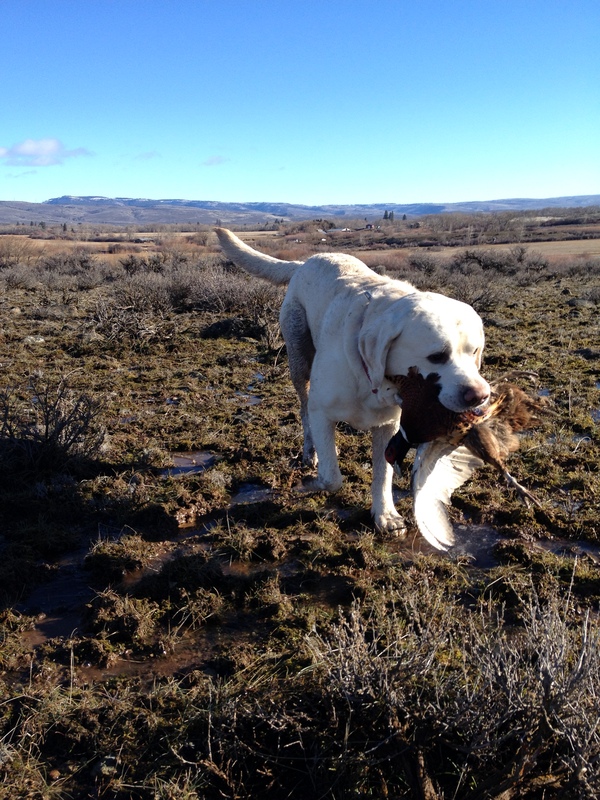 “MONGO!” shouted Dad, and Mongo plunged into the sagebrush to flush the pheasant. The bird erupted form the scrub and burst into the air. Dad drew a bead and fired. The bird did not drop. Dad continued to track the bird, and fired again. The bird fell into the sage, and Mongo was on him in a flash. Mongo quickly brought the bird back to Dad, and they were on the move again. They bagged another bird as they walked along the top of the mesa. Sometimes Mongo followed Dad, sometimes Dad followed Mongo. They wove their way to the other side of field, where Dad could now see the truck. He and Mongo were walking on a path, side by side. Suddenly, they parted ways. Mongo followed his nose right, Dad saw something to his left. Dad saw a bird running into the brush. Mongo was following the same bird’s trail backwards to where it had been hiding. Dad is an honest hunter, and shooting a bird on the ground is not very sportsman like. So he started running after it. Mongo was still making tracks heading the wrong way. “Mongo! You knucklehead! Come HERE!” But it was too late. The bird had put too much distance between he and Dad for Dad to get a good shot, and at that moment the bird decided to fly. Dad just stopped and watched it leave. Finally Mongo lost the scent and turned around. He quickly loped up to Dad. Dad was just standing there watching the bird fly off in to the distance. He looked down and said, “C’mere, you knucklehead” as he affectionately, rubbed Mongo’s ears. “You don’t even know what you missed, do you?” Dad patted Mongo’s head and turned to continue the hunt. As they walked, the ground continued to melt. So Dad and Mongo sloshed their way across the field this time. Again, Mongo came to attention by a sage bush. Dad maneuvered for the shot. “Mongo”, he shouted, and Mongo plunged into the bush. The bird burst into the sky. Dad dropped it with one shell, and Mongo quickly brought it back. Dad stood for a minute and then pulled his pedometer out of his pocket. He saw they had walked about seven miles. He looked back at the snowcapped hills to the north, and then turned south and started walking towards the truck. Mongo trotted at his side. Dad finally got a good look at Mongo when they got to the truck. Dad bent down to pick him up. Mongo was mud brown from the middle of his chest down to his toes. Dad gingerly picked him up and put him in the bed of the truck. Then Dad looked at his own feet. They were two big balls of mud. Dad changed shoes in the cab and then tip-toed to the bed to drop off the muddy boots with Mongo, trying not to get his clean shoes full of mud. He stopped for a moment and looked at his muddy buddy in the back of the truck. He knew he could not bring Mongo back to Mom-mom’s like that. Dad started the truck and then waited a moment to make a phone call. Dad dropped off Mongo with the two nice young ladies. From the looks on their faces, they clearly had not been expecting to see anywhere near that much dirt on one dog. “So, when will he be ready?” Dad asked. “About two hours…” replied one of the slightly stunned women. “OK, see you then”, and Dad headed into town for lunch. Afterwards, as he waited in line at the ice cream shop, Dad saw what happens to dogs that don’t get out much before they grow old. 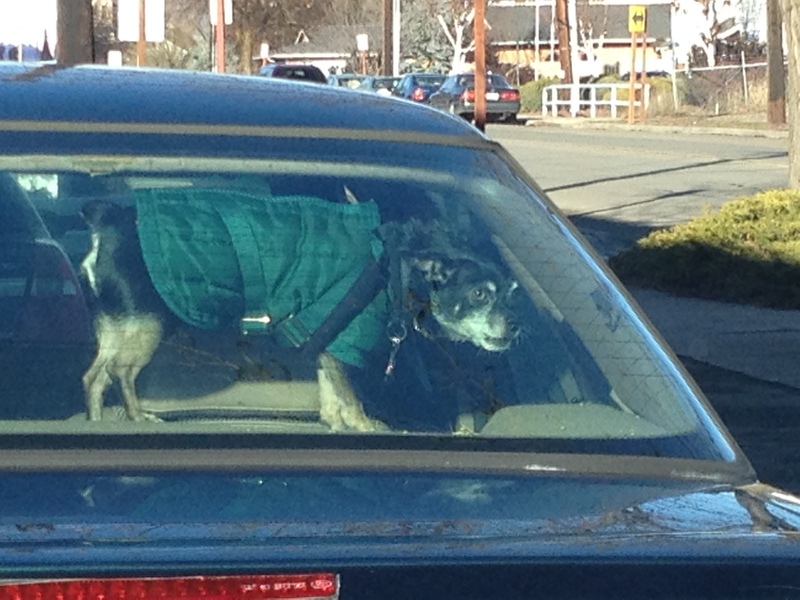 They get very cranky and bark incessantly inside the car. Two hours later, Dad drove back out to the groomers. As he pulled up, he could see Mongo had worked his magic on the two young ladies. Through the window he could see Mongo sitting on a bench like Marc Anthony, with one groomer gently brushing his back and the other feeding him treats. Dad walked over to the door. Dad laughed. He looked at Mongo and said, ”You are quite the charmer.” He paid the ladies and left them a nice tip and headed outside. As he bent down to left Mongo into the truck, he sniffed and said, “Wow, you even smell better.” Mongo wagged his tail as Dad lifted him into the truck, and then they headed back to Seattle.